Manchester United Football Club have several players who’s deals expire this summer. Now, one key name has been ticked off that list. Luke Shaw put pen to paper on a new five-year contract. After the start to the season he has made, I reckon it’s fair to say that the 23-year-old deserves it. 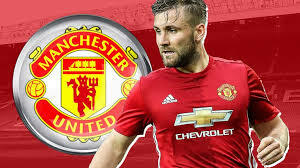 Not only has he been our best defender, but I’d say that Shaw has been our best player overall. His determination, drive, desire and willingness. We’re lucky to call him one of our own – and I’m proud to say that he’ll continue to be that for the next half-decade. I’m pleased for the man more than anything. He’s a likeable bloke who just loves to play the beautiful game. After the torrid luck Shaw has had with injuries coupled with managerial disagreements, it seems as though things are finally back on the right track. Luke Shaw deserves his new deal. Eventually got around to seeing that Mourinho was actually helping him by demanding despite all the sensationalized reporting. As I have always said, for players that really plan to succeed, criticism is an ally, not an excuse for failure. Luke Shaw deserves his improved contract. Because he took the criticism, And did something about it. Heeding the advice, from someone who sees him daily. Funny how a certain managers name is conveniently forgotten, when there is a success story to be told. Luke Shaw has apparently now signed a new long term contract. That’s our left-back spot secured for a decade then. Delighted for @LukeShaw23. Not only has he become a fan favourite, he’s gained the managers trust through hard work. It’s scary how fast his career has changed in such a short period of time.